As you know, I'm distracted and busy so proper posts are somewhat adrift. But . . . well, do you have photos which start off stacked and ready to use but which drift down like half-used balls of wool in a knitting bag? So for this post I'll rescue a recent few and bung them here. Here at the beginning, the pebbles are really gravel. But if you were to follow the beach along you'd find the pebbles get bigger and bigger so by the time you arrived at Portland you would find not only that your legs would hurt horribly but the pebbles would now be flattish and smooth and many colours - pink and brown and grey. 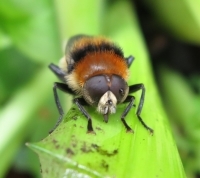 Most of them would be about the size to rest comfortably on the curved palm of your hand. I don't think it's possible to explain anything of what this is all like. You have to see Chesil Beach to make sense of - and even then it's pretty hard to grasp and even when I see it every day I never fail to find it extraordinary. 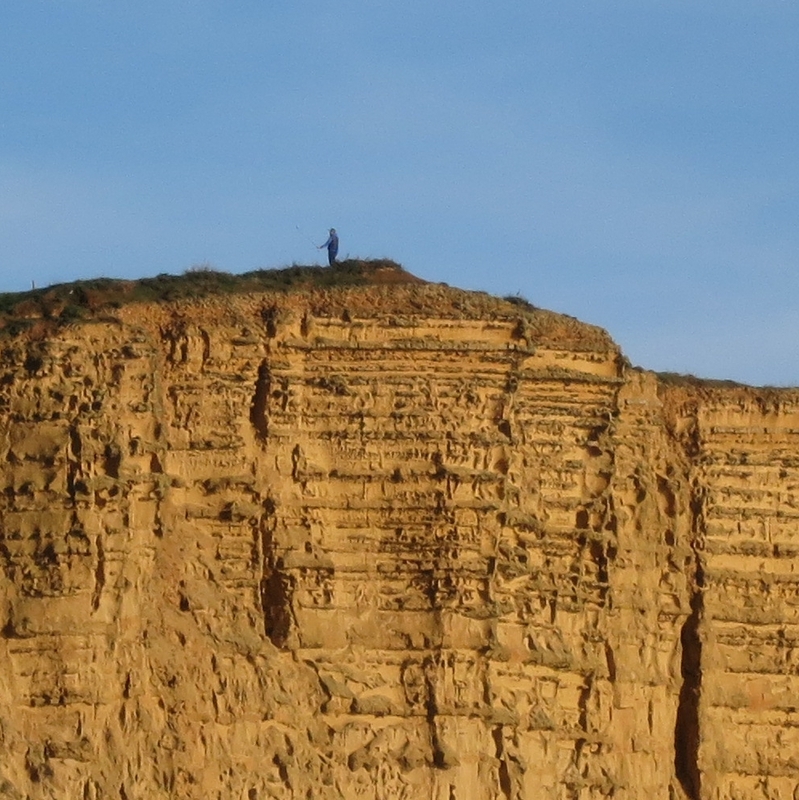 There are so many extraordinary things to wonder at; things which go beyond the merely geographical - like what is that man doing on top of the cliff? He was there quite a while. Is he practising golf strokes? Is he? And, if so, why there? . . .
Now we'll flit to the New Forest in Hampshire. 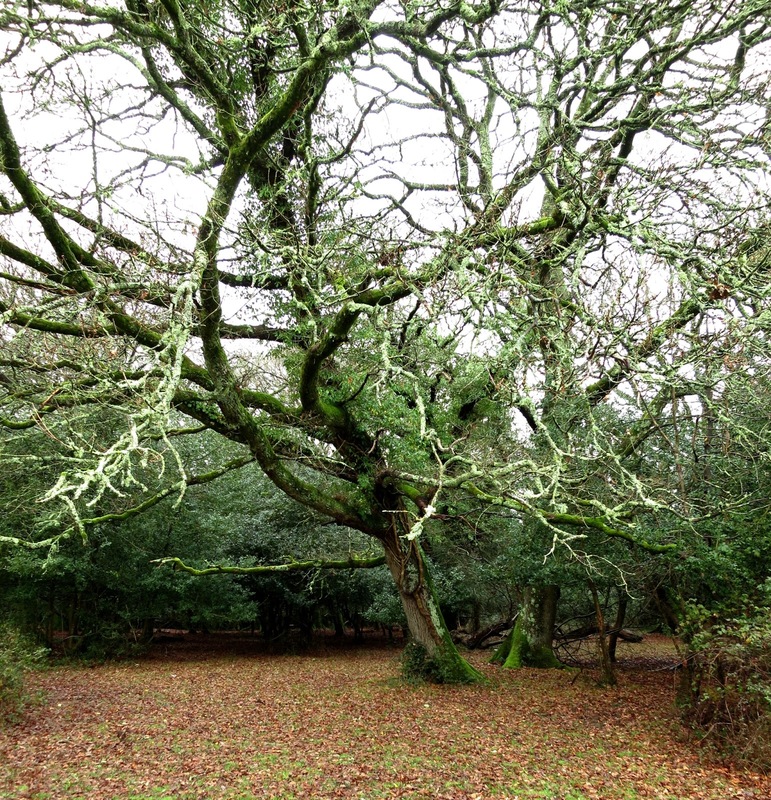 Whenever I mention the New Forest I need to make it clear this is a very old forest. (Developed from pre-existing woodland in 1079) And here is a very old tree beside the village of Fritham. 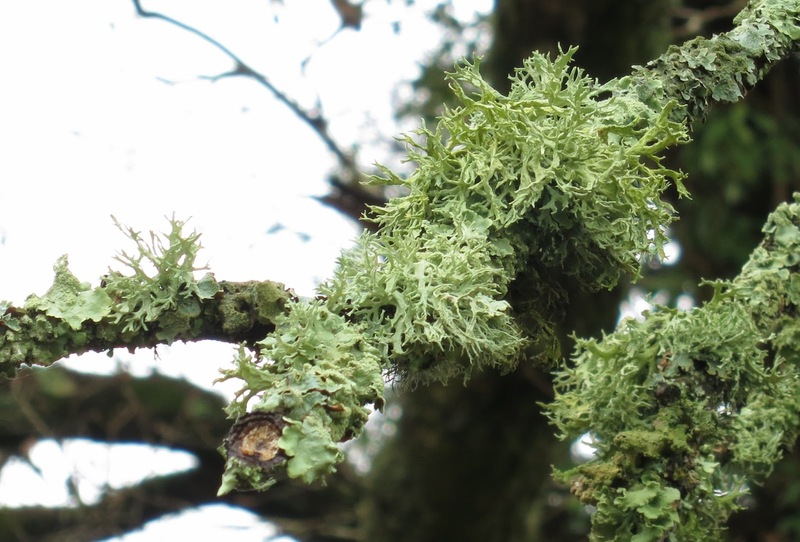 And on the very old tree there is lichen. 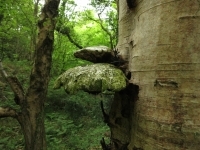 Indeed, the tree seems to be plastered in lichen . . . and moss . . . and I wish I had had time there to look at it properly while I was there. But I didn't. It was a 'Hang on can you wait a minute while I take a picture,' sort of moment. Snap. Snap. And we were away. Hurray for cameras that's what I say! In a sense I was able to bring the tree back home with me to look at it here. November 1st 2014 - but fairly confident ragwort will be flowering there still in December. And a third extraordinary. I don't know when autumn ends and winter begins. Whichever it is, it's not still summer. But some flowers flower and flower. And some flowers, like this Oxford Ragwort like to flower in extraordinary places. 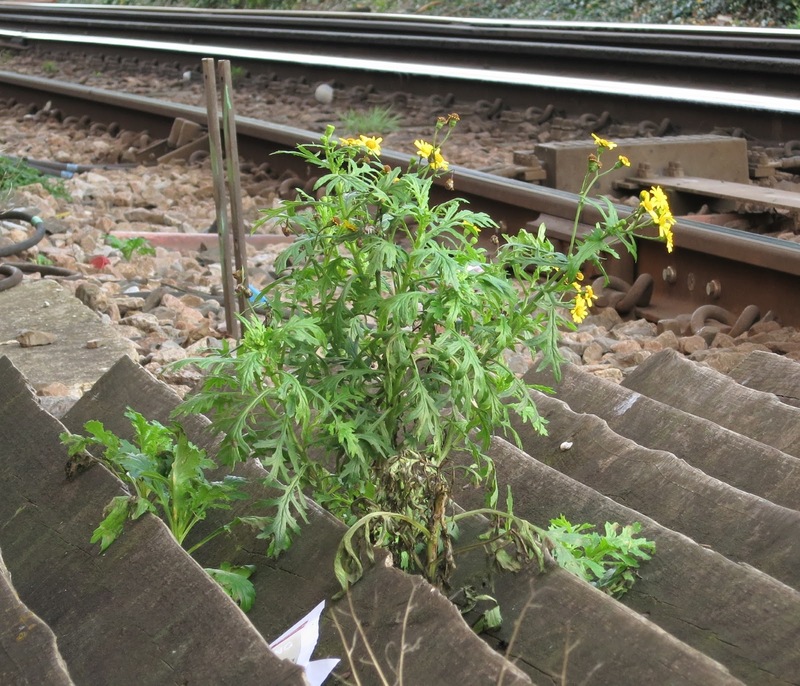 In Poole, Ragwort has taken a shine to the railway. This plant is growing through the zig-zag slats there to dissuade pedestrians on a level crossing from veering off down the tracks. And it hasn't noticed it's season is over. It's carrying the Ragwort banner, ploughing on well after its companions have died down. Closer to home, out of an urban setting, nearly always there will be an Oxford Ragwort plant flowering in winter. Personality! The same beginning but with Portland in the distance. Chesil Beach - lots of info. provided as advert by commercial company specialising in measuring underwater noise. Dorset is one of my favourite holiday destinations. I have walked along the cliff top at west bay,but have never practiced golf swings! I've been waiting, for Blotanical, which is no more - to use my tree down pictures. They've been repurposed for Blog Down. I wish you a very happy (less stress and hectic?) Christmas. I always find those grow-in-the-cracks plants fascinating--especially when they bloom way past "their season." I'd say that tree is an incredible find, too. And your quick snapshot is impressive--it looks perfectly composed. Great idea for a post! Chesil Beach is amazing and I love to stand on it near West Bexington and look in both directions at the waves and the sweep of coast. I am sure you know the story, but fisherman are supposed to be able to tell where they are on Chesil Beach from the size of the pebbles/stones. By the way, that man on the cliff was Billy Bragg singing a protest song! Sorry I am way behind with reading posts! 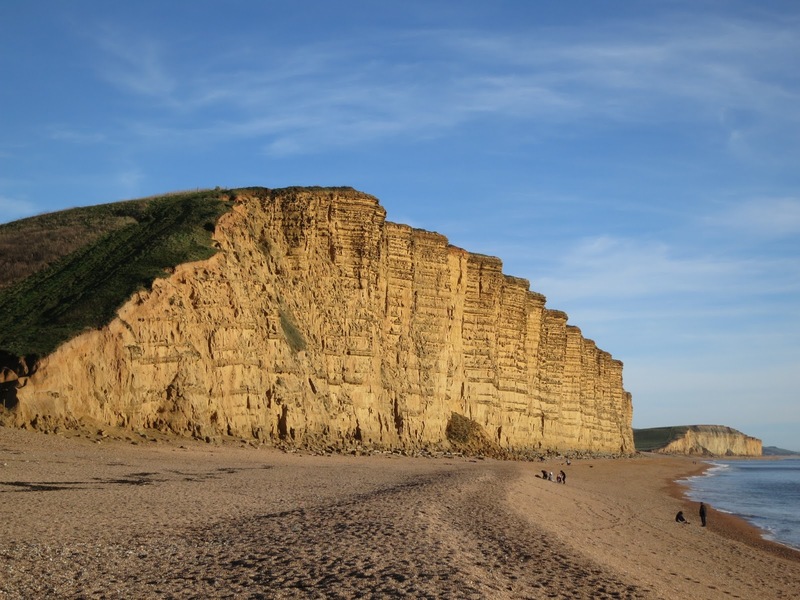 Have you recently visited West Bay or was it a picture you had previously taken? We need to meet one day, I always look out for you when we are at Sandsfoot! I can explain about the golfer there is a golf course on the top of the cliff! We often see golf buggy's on the horizon! Ian McEwan's ON CHESIL BEACH is a book I read a few years ago, when it was first published. His wonderful, haunting story was enhanced with the descriptions of Chesil Beach. I love your moss and lichens on that ancient tree.